Item #B5-PAT-2 Babylon 5 Star Fury Patch $14.95 ea. In Stock This Babylon 5 Star Fury Patch is full color, is about 6" wide by 5 1/4" tall, fully embroidered, patch says Star Fury FA-23E, 361st-FTS Ugly, but well hung, only have a few available, patch can be sewn on or ironed on. 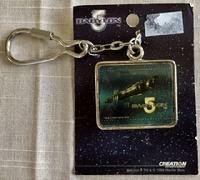 Item #B5-KEY-1 Babylon 5 Station Photo Keychain $7.95 ea. In Stock These officially licensed Babylon 5 Station photo keychain is near mint on a near mint full color backer card, chain with key ring is about 3" long, square photo is about 2 3/4" long X 1 1/2" tall, keychain is made out of metal, made in 1998. 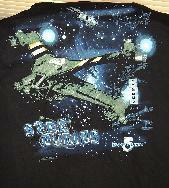 Item #B5-TS-2 Babylon 5 Starfurries Ship T-Shirt $12.00 ea. In Stock(MED. ONLY) Another great t-shirt, this Starfurries t-shirt is black 100% pre-shrunk cotton, one sided has a Starfurry ship on it, silkscreened in green with white highlights and a blue Starfurries logo on the side,this shirt comes in Medium only, with just a few available. Item #B5-MAG-1 Babylon 5- Vorlon Ship Magnet $4.95 ea. In Stock These officially licensed Babylon 5- Kosh`s ship magnets are full color, with a Babylon 5 logo in the left bottom corner each magnet is 3" long X 2" wide, made in 1997. Item #B5-PAT-1 Babylon 5 Uniform & Ranger`s Patches $8.95 ea. In Stock These full color embroided Babylon 5 patches each are about 4" long by 1 1/2" tall, your choices are Earth Alliance Uniform patch, Earth Alliance Wings shoulder patch or a Ranger`s patch (ONLY HAVE 1) only have a few of the others. Item #B5-MAG-2 Babylon 5- The Shadows Ship Magnet $4.95 In Stock (ONLY HAVE 1) This officially licensed Babylon 5 The Shadows ship magnet is full color and is 3" long X 2" wide, has small Babylon 5 logo in left lower corner, made in 1997. Item #15623 Rubie`s Babylon 5 Uniform Shirts $37.95 ea. From Rubie`s these Babylon 5 Womens Uniform shirts are out of production, each uniform comes with a dickie, uniform shirt with silkscreened uniform patches, also each uniform is made of spandex-like material, comes in sizes small, medium (ONLY HAVE 1) & large, only have a few of each size available. Item #B5-MAG-3 Babylon 5- Zaculo Logo Magnet $4.95 ea. In Stock These officially licensed Babylon 5- Zaculo logo magnets are full color and are 3" long X 2" wide, was made in 1997. Item #B5-SM-SET Babylon 5 Shapemarks Set of 5 $7.95 Per Set In Stock These officially licensed Babylon 5 Shapemarks are near mint, never been used in each set you get Lennier, Zathras, DeLenn, Kosh & G`Kar, full color, sold in sets only.